Back at it.....didja miss me? We'll jump right back into things this week, got some quick hit stuff below...some thoughts on the OHSAA football finals, a quick basketball preview, the D4 All-Ohio when it's released and some discussion on Orrville's history against private schools on the gridiron...just because. But that's later....for now, let's talk about Tim Hiller, Kyle Simmons and some post-season honors. Gonna take a little break....and counting down to 2010. Hey guys, gonna take a break over the Thanksgiving holiday. I'll be back right around the start of basketball season. Unless something earth shattering happens in the next week, consider me off the map. Hiller and his Western Michigan teammates play Ball St. (the 1-10 Ball St. Cardinals) tonight (Tuesday November 24th), the game will be televised on ESPN2 at 7pm. Tim has 98 career TD passes, 2 shy of the record set by Chad Pennington while he was at Marshall. Expect WMU to do all they can to get Tim the record...and against a team that gives up nearly 30 points per game, it might be a good bet. Here's a good article on Tim's NFL prospects and how he's grown in his time at WMU. Let's start putting a bow on the '09 football season with some end of the year honors. I was hoping to be talking about how we're making our first final 4 apppearance in 10 years, and linking to a map to Brunswick High School (that would have been the site) and researching our opponent, Chargin Falls.....but instead it's this. To kill time between now and tomorrow night. This one's going to be hard to top. But another few wins would do the trick. Regardless of what happens this weekend, I wanted to take a second and give Coach Davault and his staff some kudos on the job they've done this season. That a way fellas...get on board the Rider express. Add Genoa's Seth Dufendock (#10) to the list of Rider opponents who have felt the pain. From an article in yesterday's Port Clinton News Herald. Hey all, curious what you think of this shirt design. Is this something you'd wear or maybe even consider buying? The shirt is loosely (read: obviously) based on this cool Ohio State design. I'd love to use the "earned" slogan also, but don't want to be completely unoriginal. Got this message in my email this morning. Doing my part to promote it. Saturday's playoff game is going to be a black out, so anyone attending the game please dress in black to support the Red Riders! Another idea that we came up with is to put little rocks or gravel into an empty milk jug, for an inexpensive noisemaker and another way to show your spirit! I knew the milk jugs would make a comeback.....They were a staple of our playoff runs back in the late 90's. If there was only a milk company in town where we could get some jugs. Oh. These guys. I'll guess they'll work. I'll spare further critique of this idea in the name of showing school spirit. If this gets everyone loud and excited, great. If you need some directions on making milk jug noisemakers (cause it's a tough project), please refer to this handy tutorial. Make sure you recycle the jug when it's days as a noisemaker are over. Mr. Duxbury (and Mother Earth) will apprecaite it. Wear pink for all I care, just be loud. How about we crown a Region 14 champion? It's down to 2 teams and is set to be a dandy. Not sure it can top the Riders' heart stopping win over Genoa (did I show you the scoreboard picture? )...but there will be more on the line. Namely, a trip to the state semifinals and a shiny new trophy. Well deserved honor for the senior signal caller. Almost 400 yds of offense in one of the biggest playoff wins in school history. 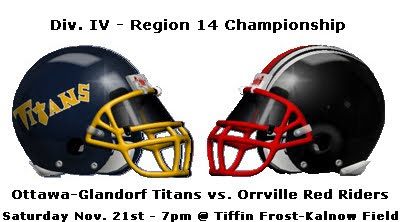 Seems to be the general consensus that the regional final between your very own Red Riders and Ottawa-Glandorf will be played at Tiffin's Frost-Kalnow Stadium. Let's go with that knowledge and look at drive time and the stadium itself. Poll: What's our greatest playoff win? New Poll below....fresh off the heels of the Genoa win, it got me thinking...what has been our greatest playoff win...not the win that meant the most in terms of state titles or anything like that...but the game itself. In this picture.....Ashland = Genoa. Courtesy of Scott Ferrell Photography. Great game Riders!!! Felt real good as a fan to get this one. Three more to go. David Lee Morgan...Jim Isabella..Jonas Fortune...you just made "The List"
I guess I shouldn't complain...this is more respect that most are giving us in this game. Beaven....thanks for the support. Free Smuckers jelly is on the way. Can't believe it's only week 2 and there's only 10 teams in the Akron Beacon's coverage area that are left....and Hillsdale being in the ABJ coverage area is a little bit of a stretch. Let's get to know Genoa, their coach, how the Riders match up, and play some video games. It's the playoffs...gotta step up your game. Riders beat Clear Fork (again).....Bring on the Comets. That was about as anticlimactic as a playoff game can be, wasn't it?. The Riders dispatched of Clear Fork for the 2nd time in 3 weeks, this time by a 28-7 score to advance to round 2 of the state playoffs. It was their 24th playoff win in school history, and 13th playoff win by 21 points or more. 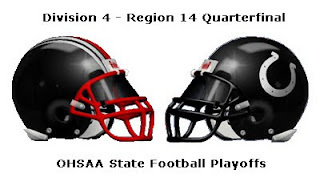 Awaiting the Red Riders in Round 2 is the Genoa Area Comets. The game will be played at Ashland Community Stadium. A couple of more old team pics to carry you over to tomorrow night. There's "website dork," and there's "video game dork," I'm now both. As if you didn't already know of my extreme dorkism....but I'm taking "nerd" to a whole new level....combining video games, Orrville Football and game predictions. Yes....I simulated this Saturday's Orrville-Clear Fork game via NCAA College Football '10 on the Xbox 360. From today's Daily Record....good article and picture by Zach Bolinger. "I don't ever come off the field, but I kind of like that. I get a lot of skulls each week." Getting excited for this Saturday. Nothing like playoff football in Orrville. 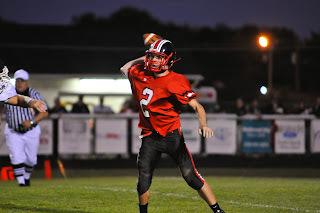 Last Week: Orrville beat Wooster 15-7, Clear Fork beat West Holmes 28-7. 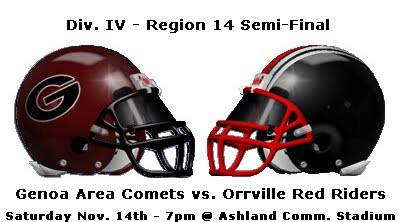 Playoff History: Orrville is making their 20th appearance in the playoffs, their all-time playoff record is 23-18. Clear Fork is making their 11th appearance, and is 3-10 all-time in the playoffs. Coaches: Doug Davault is 30-13 in his 4th year as Orrville coach, he's 2-1 in playoff games. Dave Carrol is in his first season as Clear Fork coach, he has a career playoff record of 3-6 (all at Urbana). Radio: Game will be broadcast on WQKT (104.5 on your FM radio dial)...and also webcast on WQKT.com.